The American Southwest and Arizona in particular play host to an incredible amount of bird species throughout the year. Migrating waterfowl pass through the area in huge numbers each winter and spring. The sky islands in southeast Arizona provide some of the only places in the North America to see exotic birds like the Elegant Trogon and Eared Quetzal, while the pine forests and mountains up north sustain great varieties of Woodpeckers, Flycatchers, and Thrushes. Each season brings new birds to anticipate and appreciate, but these highlights are not the only birding attractions. Just as important and noteworthy are those birds you can find throughout the southwest year round. They can be found consistently, often easily, regardless of the season. Like regular patrons at a restaurant, they can be counted on any month of the year. Every once in a while it's nice to stop and salute some of these staples of southwestern birding; birds I so often pass over in the pursuit of rarer visitors, but which provide that foundation for great birding in the southwest all year long. 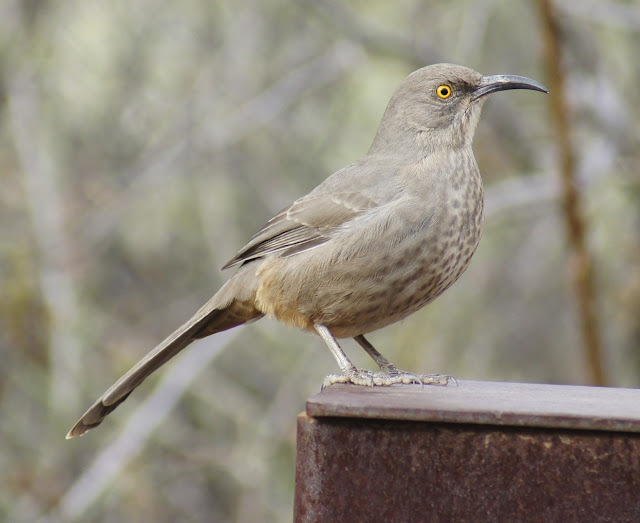 Birders often look to the trees and look to the sky for their quarry, but the Curve-Billed thrasher is quite content with life on the ground, or close to it. They can be found throughout the southwest, digging and thrashing into the top soil or picking apart cactus fruit. Like other Thrashers, they will take to the treetops and vocalize when they're hoping for some female attention. 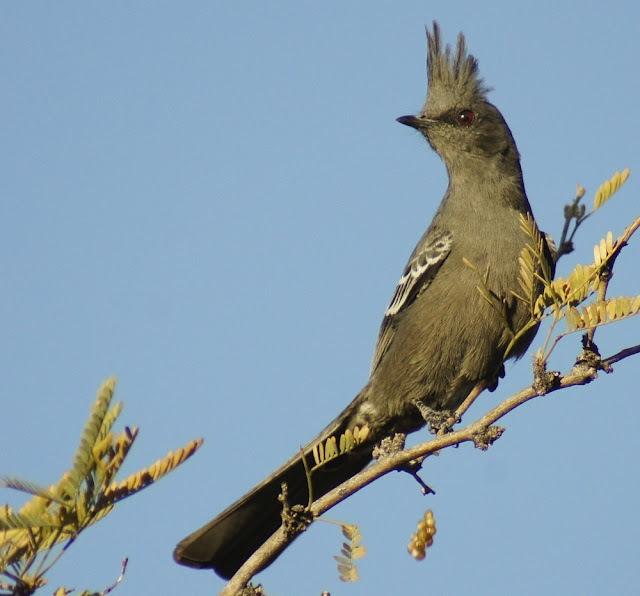 If you head out of the city and survey the mesquite and mistletoe along the highways, there's a good chance you'll see Phainopeplas adorning the treetops. These silky sentries strike out an unmistakable silhouette atop their prickly perches and bring a wonderful splash of vibrancy to the arid landscape. The jet black male with his ruby eye is in a class of cool all to himself. I looked it up and the name Phainopepla means something like "shining robe" in Greek. So, my original guess of "super suave awesome bird" wasn't too far off. 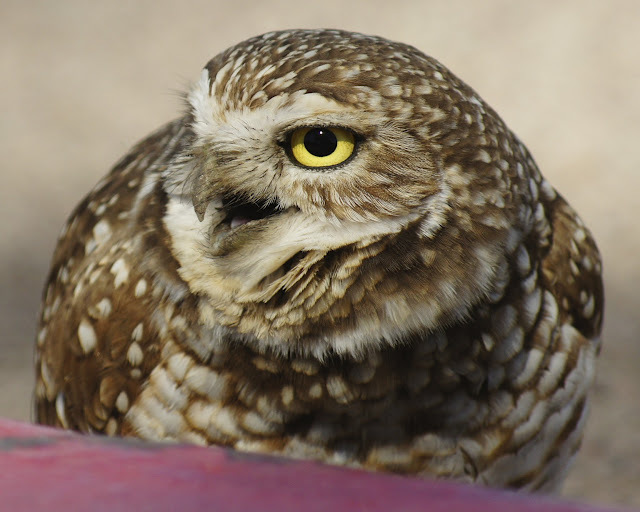 While the Phainopeplas guard the canopies, Burrowing Owls keep their stoic vigils on the ground. With their soft browns and whites, these charismatic and expressive birds embody much of the southwestern desert, thought to be fair their range extends beyond the Sonoran Desert. 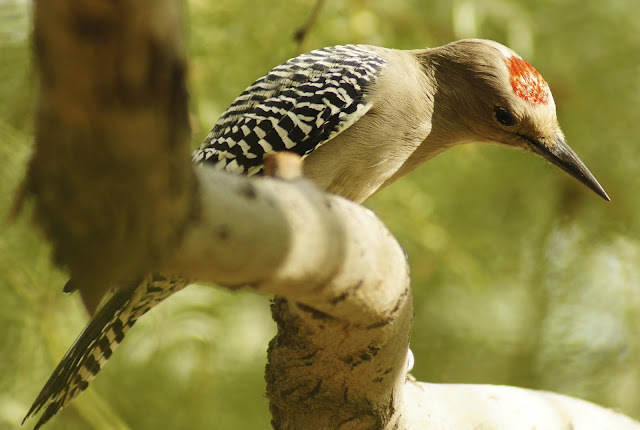 The Gila Woodpecker is another Arizona essential. They don't stray out of the state too often, but they're very common and visible within their locales. Their black and white backs and wings are very striking, but not quite as much as the red thumbprint atop the Gila's head. 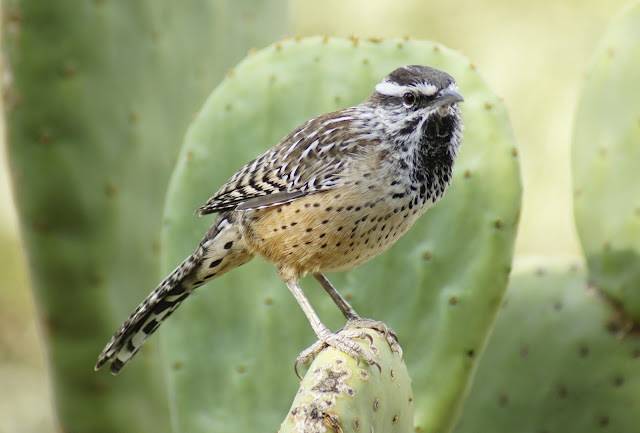 The Cactus Wren is a cacophony of sound and color. The largest and perhaps loudest of the Wrens, they proudly wear the mantle of Arizona's state bird, and these ambassadors can be found throughout the saguaro forests, desert canyons, and suburban backyards all over the state. 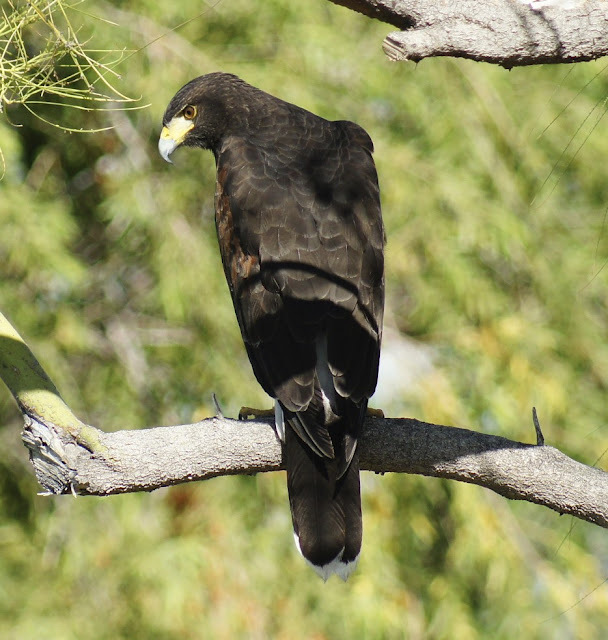 The southwest is also home to several unique and rare raptors such as the Gray Hawk and Common Black Hawk. But the Harris's Hawk is much more visible throughout the states, in part because it is much more common. 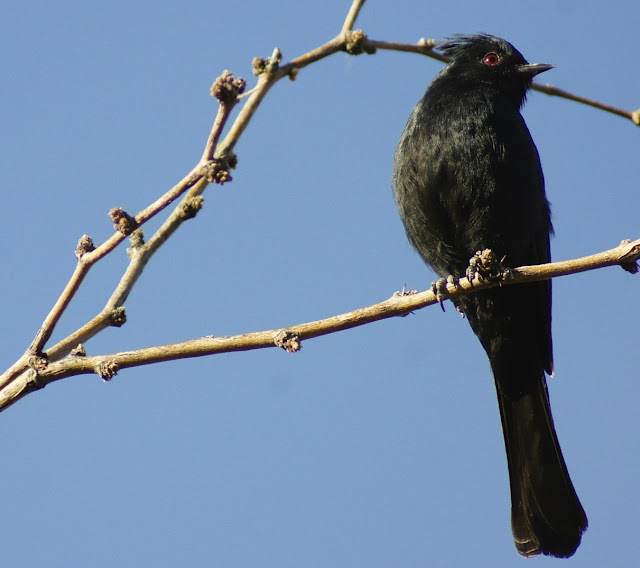 Their unique, dark coloration makes them a feast for the eyes, and their tendency to form into small hunting parties of 2-4 birds and terrorize the Phoenix canals makes them one of the dominant predators in the area. At the other end of the spectrum, both in terms of size and predation, is the Verdin. This small and vociferous desert dweller is the only North American member of the Remizidae family. 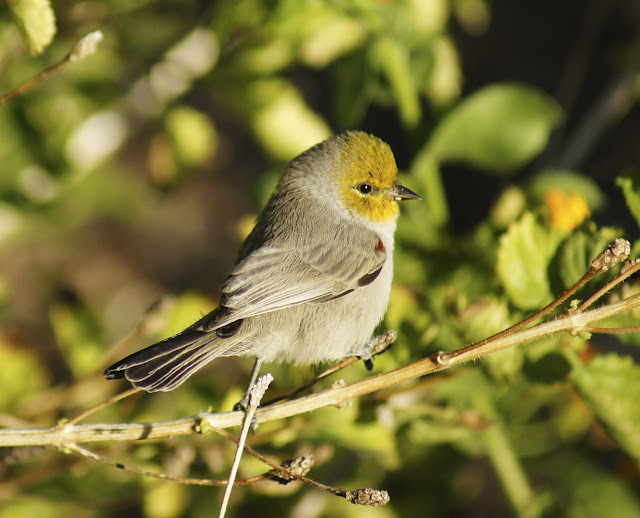 With so many warblers and other songbirds being only partial or migrant residents in Arizona, the Verdin is one of the few small and colorful songsters to stick it out through summer and winter. The Abert's Towhee is also found year round, though they are admittedly less visually striking than the yellow-faced Verdin. These shy birds keep the Curve-Billed Thrashers company down on the ground, under the chaparral, and wherever else seeds can be found. 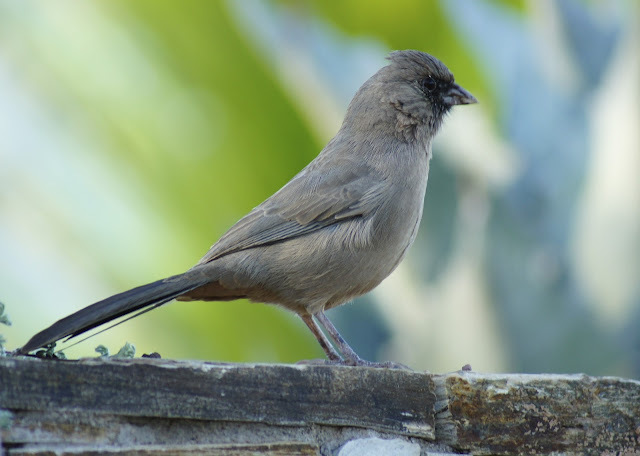 I believe their black bandit mask accounts for their relative anonymity compared to the other, flashier Towhees. 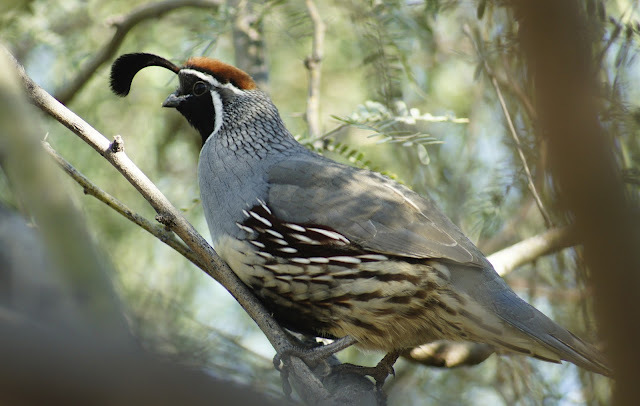 The Gambel's Quail is another masked denizen of the desert scrub, but this bird garbs itself with much more pomp and fanfare. A rufous cap, bold white stripes on the face, and of course the Renaissance plume all make for a very regal complexion. Despite their apparent aristocratic fashions, they prefer running and walking to flying, and are not above gorging themselves on wildflower seeds and dried bread crumbs at feeders throughout the Valley. 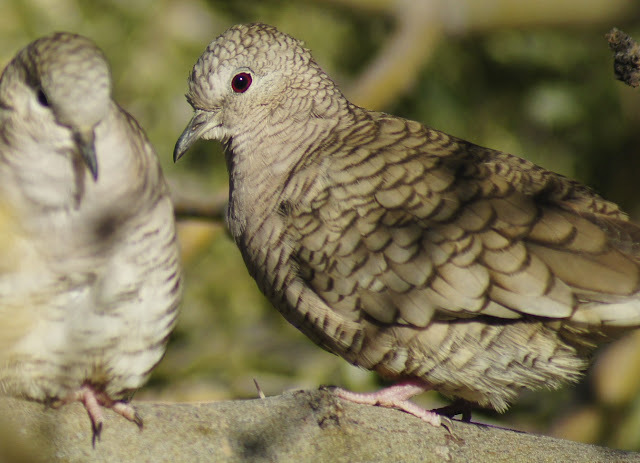 The Inca Dove is one of the Quail's humble companions at the feeders. These soft, yet scaly birds seem to have a great kindness in their eyes, and they're one of the few species that can be found exhibiting good manners in the bustle for food at the feeders. 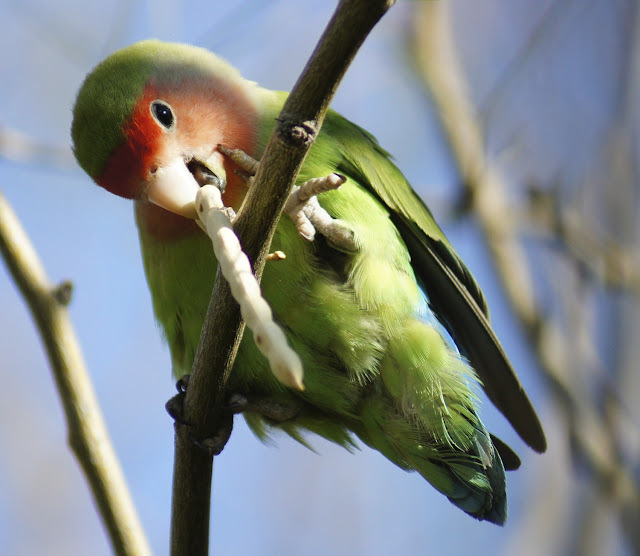 It is a widely believed fact that Edward Binney and C. Harold Smith, the inventors of Crayola Crayons, used the Rosy-Faced Lovebird as their inspiration. Including a Rosy-Faced Lovebird in the "Arizona Essentials" category is sort of illegitimate, seeing as it's an introduced species. However, they fit the criteria of being common, year-round residents, and they were just recently added to the official Arizona state birding list. All of that aside, it's definitely a bird worth seeing if you're in the area. The different regions of North America all have their staple species. We often research the unusual or rare birds in an area before we visit, and often times these more common birds are ignored (probably because we've already seen them). However, these staple birds deserve some recognition. Like a primer for paint, they provide a foundation for great birding in an area all year long. The migrations times are wonderful, but wouldn't the rest of the year be bleak without the regulars? I dare say we birders wouldn't be able to cope without them. I can see I need to plan a trip in the near future. Not one of these beautifully photographed birds shows up on my life list. You have such beautiful birds in Arizona Laurence!This post makes me want to come back there. There are some many avian treasures, it can be real work to not become jaded or take them for granted. I'll be anxiously awaiting your photos when you do manage that visit! What a wonderful assortment of beautiful birds! Thanks Ken. I'm guessing most of these desert species trail over into New Mexico as well? Very nice site, great pictures. Looking forward to updates! Leuk dat je van out Nederland aan BIF heeft gekomen! Mijn vrouw heeft ook in Holland gewond dus ze vindt het geweldig dat ik voor het eerste in nederlands mag beantwoorden. Thanks Debbie. If you ever get a chance to bird in AZ, they'll be waiting for ya! Wonderful level of photography, love the Little Owl close up. Thanks for your kind comment Christian. The Burrowing Owls--very similar to plumage to the Little Owls in UK--have definitely been one of my favorite sightings this year. Thanks Chris, we've got it pretty good here in Arizona. There are a few spots around the Phoenix area where they are dependable sightings, with the 16th Street Rio Salado Preserve spot and the north parking lot area at Scottsdale Community College being the best two (the owls don't pick the most scenic burrow sites). Let me know if you're in the area and want to check it out. Okay, now I'm totally drooling over all those AZ beauties! Awesome photos as usual! Ha! I know that Quail is supposed to be pretty delicious, but I'm not sure how much meat we'd find on the Verdin. At least they're a feast for the eyes! Glad you stopped by, thanks for your kind comment. Great post and beautiful birds. The Verdin is a beauty! Many thanks Eileen. The Verdins are lovely, a unique southwestern take on the warbler. Thanks Jeremy. Down there in Tucson you've got quite a few more super staple birds too; it was awesome to chef them out with you a few weeks ago. Great post Laurence! I really enjoyed your excellent photos! Thanks Tammy. Another bonus with the staple birds is you get lots and lots of opportunities to photograph them. Eventually I get lucky. Fantastic post! You really packed it in tight. Who needs vagrants when you've got staples like these? Great post Laurence and some fantastic photos of gorgeous birds. Gotta get out west again to bird. Thank ya Dan. It's a wild west sometimes, but there are plenty of stable birds to count on. I have never seen any of the beautiful birds featured in this wonderful post. I really must take a trip out to the southwest. Each and every one of these photographs are fantastic! Terrific post! Thank you Julie. Perhaps the nicest thing about these birds is the near guarantee that you can see them all any time of the year if and when you come down for a visit! Each bird is a unique delight to look at. Thanks for sharing them. Cheers, Ruby. Thanks Ruby; it's a pleasure to share.